Reproduction set includes the cover and (8) 8x10 images on digital media paper. 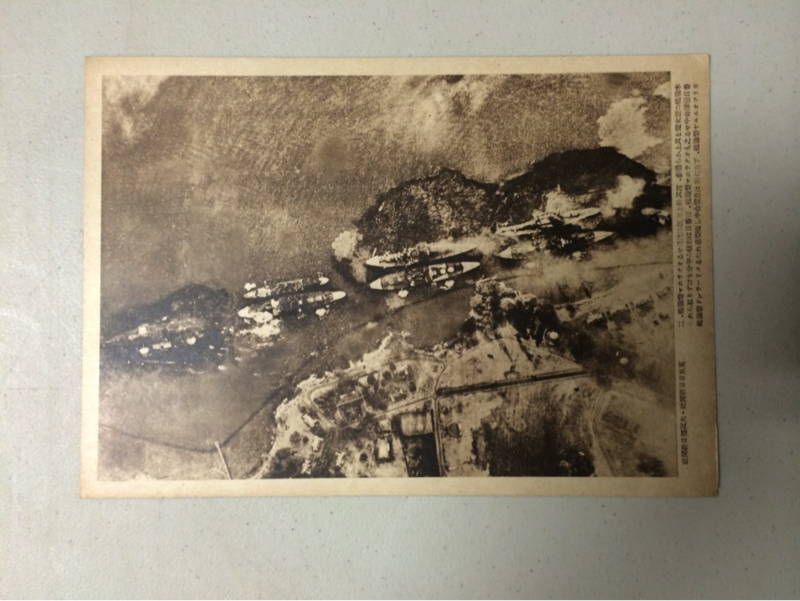 Set of photos documenting the Pearl Harbor Attack. These photographs were taken from Japanese planes as they bombed Pearl Harbor on December 7, 1941. They were released by the Japanese Navy and published jointly by the Osaka Asahi News and the Tokyo Daily News as early as January 15, 1942. These first recorded views of the bombing of Pearl Harbor are documentation of one of the most successful military operations carried out by any nation. The aerial photographs provide a perspective that America never had capturing the sequence of events of the actual strike. The original photos were owned by the Imperial Japanese Navy which employed local newspapers to print and distribute as war propoganda in an effort to inspire the local population. This was a proud moment for Japan and as the title suggests, they felt they had accomplished the goal of destroying the Pacific fleet. This set is in excellent condition and contains the original packaging envelope. Images measure 7 x 10 ½ inches.